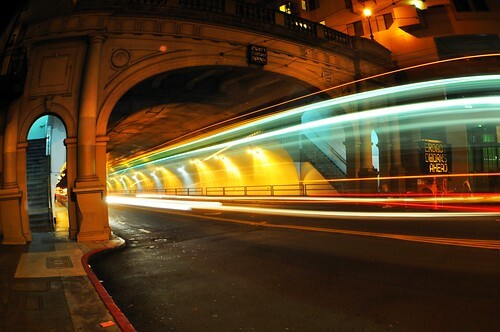 stockton tunnel, originally uploaded by hep. fisheye. 10 second exposure. muni: the 30 stockton. I love your photos soooooooooooo much. This almost looks like a painting, amazing! awe thanks! you can't even tell it's a bus! not much at all. i run everything thru autocontrast and autolevels to rebalance if i was not paying attn while shooting, but then it was pretty much straight to upload. i already knew how to set this shot up pretty good since i've done the same shot like 5000x at different locations. hyperrealism as applied to painting? i wasn't aware there was a photography genre as such! Oh, wow. I love this one! so cool! did you have a tripod or did you hand hold this? tripod for sure. i can only handhold steady to like 2secs then i start shaking all over hehe! Do you ever have people walk into your longer exposure shots? I know I have enough trouble taking point and shoot snapshots in public. When we made pinhole cameras in high school, I wanted to bludgeon people who walked into my shot, but that was a lot more trouble to do over again. This is awesome, I love the subtle bend. The colors are so crisp!